I’m not even going to pretend to be chill about this. I LOVE G. Willow Wilson. Her Ms. Marvel has been my favourite comic on the stand for years now, her graphic novel Cairo is amazing, and her prose novel Alif the Unseen is spectacular. She’s not just one of the best writers working in comics today, she’s one of the best writers today, full stop, across multiple mediums. I’d be hard pressed to think of anyone I’d rather have writing Wonder Woman. So yeah, I’m pretty excited for this run. I’m less familiar with Cary Nord. I know his name and I’ve undoubtedly seen his work over the years. You can’t consume as many comics as I do without seeing everybody’s work at some point or another. But I don’t remember the specifics of it, which is kind of fun. Going into a book without any artistic expectations is exciting, and rare for a comics nerd like me. And I certainly found a lot to like here. Look away if you haven’t read this issue yet! Trust me, it’s good, you’ll want to buy it first! G. Willow Wilson wrote it, for goodness sake! That should be an automatic buy! I can’t decide if bringing in Ares at the start of a new Wonder Woman run is a cliché or tradition, though I’m leaning toward tradition right now. Perez did it, Azzarello did it, Rucka did it, Patty Jenkins did it with the movie. Ares is Diana’s arch nemesis in a lot of ways, representing the antithesis of everything she stands for, plus he ties so well into her mythological heritage. It’s just a good fit. And here we’ve got that same fit, with a twist. Ares is back once again, surprise surprise. But with a new mission. He is no longer focused on destruction, at least not for the its own sake. Now his focus is on justice. When he comes face to face with Wonder Woman at the end of the issue, he explains that he’s returned “to battle alongside you against tyranny and injustice.” And he’s kind of doing it, too. The issue sets up an interesting conflict. The nation of Durovnia is a democratic country, allied closely with the United States and generally respected on the world stage. However, the government is actively suppressing an indigenous ethnic minority and their independence movement. That’s the tricky thing about democracy. It represents the will of the majority of the people, but when this majority has an unfavourable view of minorities, things can get bad. No obvious parallels spring to mind immediately, but it would be like if racist white people in America elected a demagogue who spouted false claims about African Americans and Latinos to rally his base. Can you even imagine? That would be terrible. But back to the comic book. The independence movement in Durovnia has a new leader, one committed to a more aggressive, violent course of action, and now the nation is at war. 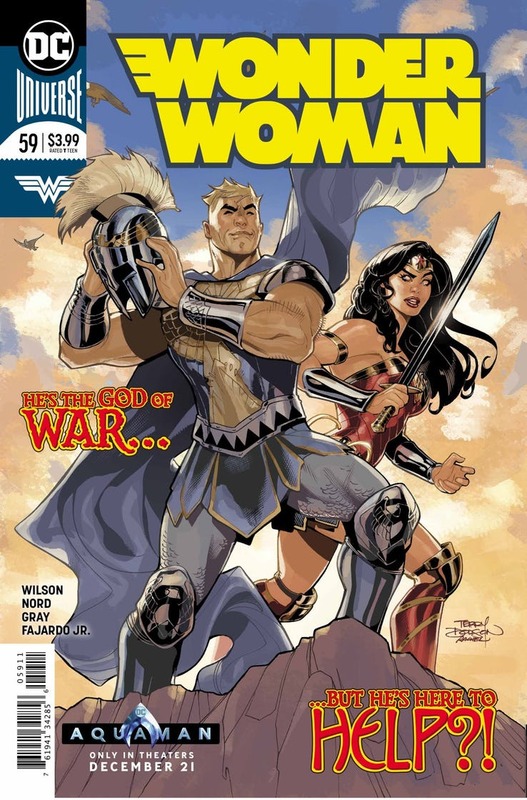 When Steve gets caught in the conflict, Wonder Woman swoops in to save him. And, in pitch perfect Wonder Woman fashion, she ends up fighting both sides. Because of course. Wonder Woman doesn’t care what you’re fighting for. If you’re putting innocent people in danger, she’s going to bust you up. That bit, and Diana’s refusal to listen to Etta telling her to stay out of it, was all especially nicely done by Wilson. Turns out, Ares is the new leader of the independence movement, which is fascinating. We’re used to him being evil, so of course our first instinct is to assume that these revolutionaries are bad guys. But once you think about it for a second, it gets real murky real quick. The Durovnian government clearly aren’t the good guys here, what with a majority suppressing a minority. And an ethnic minority’s desire for independence is an enormously sympathetic cause. So maybe Ares is on the right side here? Even more interesting, he’s got this new dedication to justice and appears to be standing up for a noble cause, but he’s still the dang god of war. As much as he’s all about this new ideology, he’s using his old tricks, relying on conflict and bloodshed to accomplish change. And wow, I cannot wait to read Wonder Woman navigating this entire scenario. Ares making good choices in bad ways is going to present a real conundrum for Diana, and I’m curious to see how she proceeds. And doubly so how he reacts if she decides to take him under her wing and tries to teach him alternatives to violence. There’s so much to dig into with this new twist on Ares. Cary Nord’s pencils and Mick Gray’s inks throughout the issue were solid, if perhaps middle of the pack relative to other artists we’ve seen in the post-Rebirth era. Wonder Woman has been blessed with some amazing artistic talent over the years, and Nord’s approach here has some ups and downs. I love how dynamic his Wonder Woman is. She hits a lot of cool poses at interesting angles, and he captures both her grace and fierceness. She seems a tad scrawny and doe-eyed, though, and is drawn a bit inconsistently. It feels like Nord’s maybe not quite settled into the book yet, and fair enough. It’s his first issue. There’s certainly a lot of nice stuff here, across the board, and I’m excited to see how he grows with the character as the run progresses. Also, our favourite friend Romulo Fajardo Jr. is still on the book! With excellent colour work, yet again. As always, Fajardo shows that he’s able to adapt his colours to the style of the artist and melds flawlessly with Nord’s linework. They’re a good pair, with Fajardo adding depth to the background work and life to the characters where called for, but also pulling back a bit when Nord chooses to be more sparse. Ultimately, I’m so looking forward to the next issue of this run. Wilson and Nord have set up quite an interesting situation for our amazing Amazon. Also, there’s more than just Ares going on here! Steve is captured, and we’ve got mythological creatures on the loose in Durovnia. This first issue has laid out a lot of fun and compelling elements, and I can’t wait to see where it all goes. Let’s start with some happy news: This run is going to end. We’ve always known this in the abstract, of course. Creative teams at the Big Two never last forever. But now we’ve got a date. 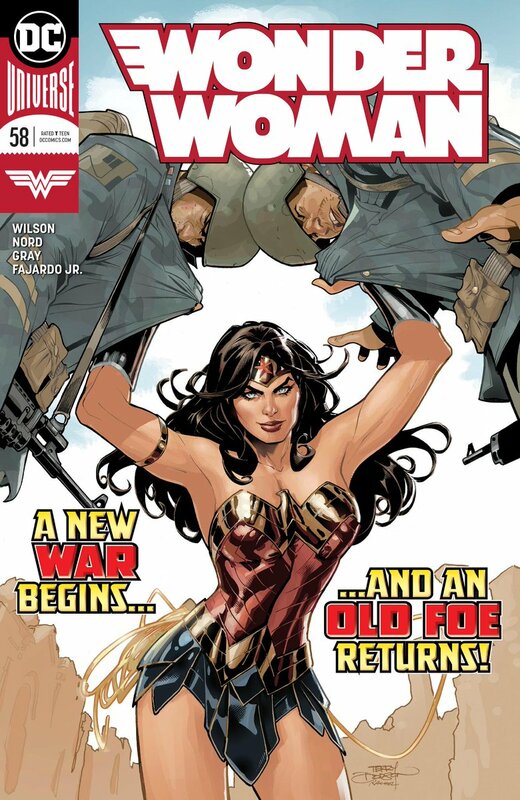 On July 11, 2018, Wonder Woman #50 will come out and mark the end of James Robinson’s tenure writing the book. While it’s kind of a downer that they’re letting him write such a landmark issue after months of churning out terrible work, the bigger news is that it’s finally over. 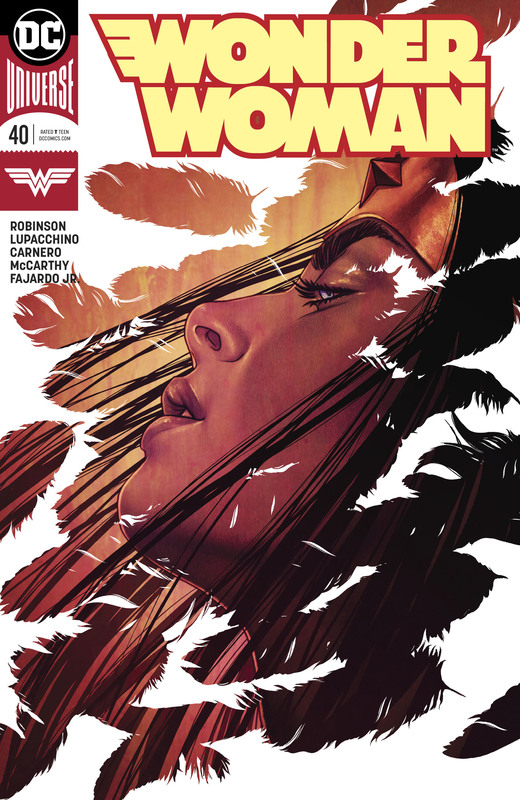 Steve Orlando and Laura Braga are taking over for a brief arc starting with Wonder Woman #51, and then a new, yet unnamed creative team will come in. I’d be excited for anyone not named James Robinson to be writing the book, but Orlando is an especially good choice. I’ve enjoyed his work for a while now, and from his few comments on what’s to come it sounds like he’s got a good handle on Wonder Woman and why she’s amazing. Braga is a great choice, too. She’s done fantastic work on DC Comics Bombshells, and I’m looking forward to her drawing Wonder Woman in a more modern setting. It should all be a lot of fun. We’ve just got to slog through five more issues to get there! I am about to ruin the conclusion of this foolish arc! Look away if you don’t want to know how Darkseid loses because… love? It doesn’t make any sort of sense. As I just mentioned, in this grand finale to months of painful storytelling, Wonder Woman defeats Darkseid with love. More specifically, she uses her love for her brothers, sisters, and other divine relatives killed by Darkseid in his quest to repower himself, loving them so fiercely that she somehow pulls their souls from his body. Darkseid, now weakened, burns up and disappears. So, yeah. The thing is, Wonder Woman and love go hand in hand. Her compassion and her kindness have been hallmarks of the character from the very beginning. When William Moulton Marston created her, he made her the embodiment of the loving authority of women. If any superhero is going to use love to defeat a villain, it’s going to be Wonder Woman. The problem is, it still has to make sense. There’s need to be a degree of logic. You can’t just say that Diana’s love is “bright and true” and then ta-dah, Darkseid is done. Wonder Woman is not some sort of loving necromancer. She cannot draw out the souls of the dead through sheer affection alone. And even if Robinson and co. wanted to make this a new superpower for her, then okay, explain it. It’s a bad, silly idea, but make it work. Set it up in some fashion. Do a little bit of foreshadowing and table setting so it doesn’t come off like a bizarre deus ex machina. Love is a wonderful, powerful thing, but to use it to such a degree, entirely out of the blue, kind of ruins the entire ending. Well, “ruin” is the wrong word. That implies that there was something good to begin with. But it’s cheap, and unearned, and generally dumb. On top of that foolishness, this issue continues one of my main frustrations with this run: Robinson’s focus on male characters. I’ve said it a million times, but this book is called Wonder Woman. She should be the main character. And, almost as importantly, women should play an important role in the series, across the board. In this issue, we start with opening narration from Steve Trevor. Then Jason, a man, goes to Themyscira to save the Amazons from Grail’s attack. And finally Grail, once captured by the Amazons, is imprisoned with Ares so that HE can teach her the values of love and peace that he has learned. Learned from women, I might add; his wokeness comes from submission to Aphrodite and the Amazons. That’s too many dudes doing too many things. All while Wonder Woman defeats Darkseid in the dumbest of ways. This issue is basically the culmination of so many terrible ideas. Bringing back Grail. Giving Diana a brother. Ignoring every rad female supporting character in the Wonder Woman mythos. Letting James Robinson write a comic book after, I’m guessing, he traded his skills at storytelling to some sort of evil leprechaun for magic beans? I’m not exactly sure how his writing turned so bad so quickly, but the larger point stands: The dude is doing garbage work here. And all of that combines into this boring, nonsensical conclusion that lacks any excitement, heart, or reader investment. At least it looks pretty good. So long as you’ve got Emanuela Lupacchino drawing Wonder Woman, even if it’s just for some of the pages, it’s going to be a book worth looking at. She captures the character so well, and Ray McCarthy does a great job inking her work. Marco Santucci is solid, too. I prefer Lupacchino, but he carries off his pages nicely. And of course, series MVP Romulo Fajardo Jr. holds everything together with his coloring. The dude’s a magician. When books go off the rails like Wonder Woman has as of late, often times it shows up in the artwork. You see rushed drawing, and everyone down the production line starts phoning it in. While we’ve had some instances of hasty linework over the past few months, Fajardo Jr. has been making everyone look better with every single issue he colors. Give the man a dang raise, DC. So, Darkseid is done, and now we’ve just got to get through some sort of Metal tie-in for the next five issues. Then we get a new creative team and maybe we can enjoy the book again? Gosh, I hope so. I’m real tired of hating what should be my favourite book. I am about to tell you the ONE SOLITARY THING that happens in this issue! And it is neither good nor interesting! Why must DC make us suffer so? Hold onto your hats, gang, because I’m about to unleash the book’s big reveal. You know those artifacts that A.R.G.U.S. has? The ones that Darkseid has been jonesing for over the past few issues because they’re central to his big, evil plan? Well get a load of this: He attacked A.R.G.U.S. and got them all, and now his big evil plan can come to fruition. Your minds are blown, I know. There was one almost interesting thing about this wholly expected development. I was waiting for a fight, some sort of major assault on A.R.G.U.S. with lots of action and drama, but for perhaps the first time in this entire run, James Robinson zigged when I thought he was going to zag. Instead of a battle, Darkseid just straight up steals the entire building, and I didn’t see that twist coming. It’s not a particularly good twist. Or a fun twist. But it is a twist, and for that I commend him. And now I slowly walk that commendation back because lord knows there was a lot of space for a big battle on offer in this issue. Everything apart from the last handful of pages was useless conversation. Not to say that all conversation is useless in comics, of course. I like some banter. I like to learn about the characters and have them bounce off each other. Chatty books are fine with me. I don’t need loads of battles and action and whatnot. The problem with this issue’s conversations, though, is that they were largely pointless. Steve and Jason just rehashed old stuff without adding anything new to the mix. 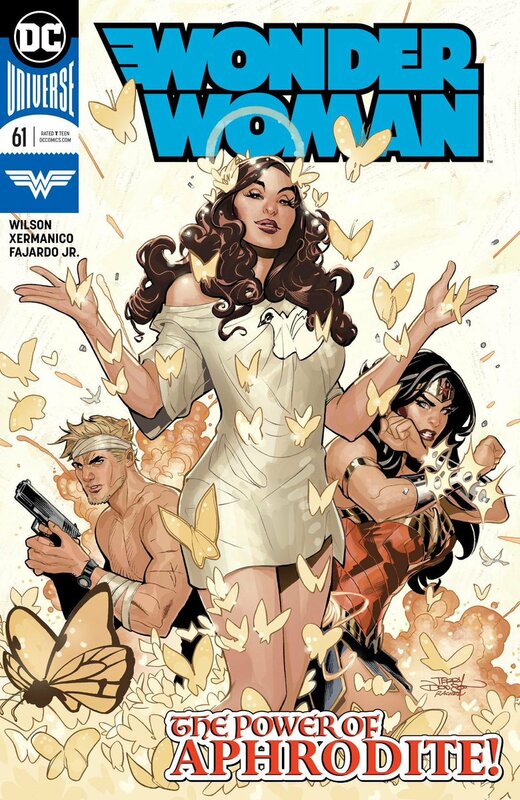 Wonder Woman interrogated/fought the Furies and learned pretty much nothing from it. Darkseid said vague things about his evil plans. None of it added to the ongoing story or moved it forward in any real way. It just filled the pages until Darkseid attacked. That, combined with the fact that James Robinson seems to have lost the ability to write dialogue that resembles actual human speech in any way, made this issue quite a slog. The art team did their best, however. I’m not terribly familiar with Marco Santucci’s work, but he acquited himself well here. The big test for every Wonder Woman artist is their ability to draw Wonder Woman, and he did a nice job from the very start, opening the book with a splash page that had a bit of a Phil Jimenez vibe. And Romulo Fajardo Jr. was amazing with the colors, as always. I know I say this all the time, but he really is the MVP of the series right now. We’ve had so many artists during this run, but his colors help give the title a consistent, high quality look. His steady excellence is the only thing stopping this runaway train of a series from barrelling into a ravine some months. Luckily with this issue, Santucci gave him a hand and we got some decent artwork throughout. So we’ve got what, about seven more issues of this run, at least? Good gracious. It looks like Wonder Woman’s battle with Darkseid is coming sooner than later. A tie-in to DC’s big Metal event looms on the horizon as well, so that should mean that the Darkseid story will be sorted out before long. Wonder Woman looks to be playing a big role in the post-Metal DC universe, co-starring in the relaunched Justice League along with leading a new version of Justice League Dark. Perhaps her increased profile across the line will bring some creative changes to her solo title, finally. Not only is it long overdue, but these big changes present a fine opportunity to make the switch. I know I’ve got my fingers crossed. I’m starting to worry that I may be trapped in Tartarus, the deepest depths of Hades where the dead are punished for eternity with cruel forms of poetic justice. 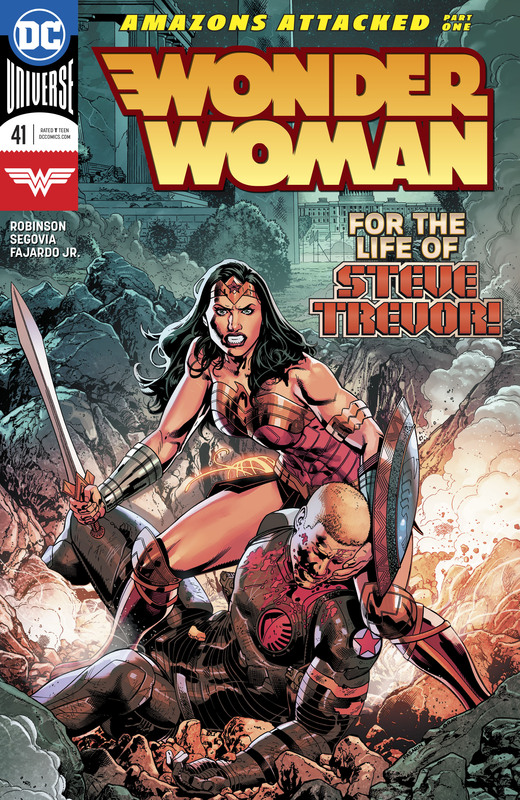 Like Sisyphus pushing his boulder up a hill, like Tantalus unable to reach the fruit above him or the water below, so too am I subjected to a terrible new issue of Wonder Woman every two weeks in a run that feels like it will never end. I’m not sure what I did to end up in Tartarus. Typically, you have to offend Zeus, so perhaps my intense and vocal dislike of his part in Wonder Woman’s current origin story played a part? Whatever the case, here do I suffer, again and again. So that’s where I am with Wonder Woman right now. I am about to reveal all of the details of this book! Maybe that’s why I’m in Tartarus, for spoiling comics? I always give a warning, Zeus! Every time! Let’s start at the very beginning today with the cover. It’s not good, but it’s dramatic. We’ve got a crazed looking Wonder Woman, sword drawn in anger, standing over her fallen love. The title ominously proclaims, “For the Life of Steve Trevor!” This must be a doozy of an issue, right? No. Not even a little bit. Steve is in the issue, yes, but he’s totally fine. The only time he’s in any harm’s way is in a flashback. Nor are he and Wonder Woman exposed to any great danger in the present. The bulk of the issue consists of a conversation between the two of them as they fill each other in on what they’ve been up to. No blood, no angst, no destruction. Also, and this is a silly nitpick, I know, but Steve’s hair doesn’t look like that in this issue. It’s longer and slicked back, not short. He doesn’t wear anything that resembles the outfit above either. All of this gets to the larger point I am trying to make here: It feels like the editorial oversight on this book is non-existent. The cover not matching the contents, both in story and appearance, is just the tip of the iceberg. Everything inside this book is a dang mess, and it’s been that way for months. The stories have been repetitive, undeveloped, and largely nonsensical. None of the characters feel right. So much of the writing is screaming for another draft following a lengthy list of editorial notes. I don’t know what the editors on Wonder Woman are doing other than sending the files off to the printer every couple of weeks. Do they not know their names go on the book too? This is a very embarrassing product to be associated with, guys. And what’s especially morbidly fascinating about the series right now is how it’s bad in a different way with every issue. The structure of this issue actually isn’t an awful idea. Diana and Steve catching up after a rough week of fighting bad guys with flashbacks to their various encounters could be good. We’d get to see them as a couple, sharing feelings and perspectives on their unique lives. It’s a nice set up. The only problem is, the writer would need to be capable of writing dialogue that actual human people would say. The stilted, hackneyed conversation we get here is so awkward that the whole thing goes off the rails with the first page. Moreover, the stories behind it all are both random and bad. First, the book starts with Darkseid speechifying about a plan that never gets mentioned again for the rest of the issue. Then we go to the Diana/Steve conversation, which honestly makes it look like Wonder Woman is losing control a bit. She’s taking down villains aggressively, and showing no concern for them. It’s wildly out of character. In one fight, she laments that destroying a mecha-creature crashed the brain of the woman powering it, not because she is presumably brain dead now, but because the women wouldn’t be able to explain the motive behind her attack. This is not how Wonder Woman rolls. Even at her lowest, laden with all the problems of the world, Wonder Woman still cares. It’s a defining trait of the character. Diana then goes to confront Veronica Cale, which is another big left turn. Cale was behind the attacks, trying to earn some defense contracts, and fine. That sort of seems like her. But what does this have to do with anything? Cale hasn’t been in the book since Greg Rucka left. She’s had nothing to do with this storyline in the slightest. I suppose she reminds us that her daughter is in Themyscira with the Amazons, and it looks like Darkseid is going to attack there soon, but does that mention require an entire issue of brawls? That seems a bit much. The book ends with everybody’s least favourite character in the world showing up. It’s Jason! And he’s got a new outfit. And presumably he and Diana are going to fight now or something. Whatever. Who cares. He’s the worst. Also, nothing in the story preceding this last page reveal had teased his return. He just shows up after this detour of an issue to get back to the Darkseid related stuff, I guess. It’s all such poor story crafting. I should say, on a brighter note, that the art is decent. Stephen Segovia does a solid job here, and Romulo Fajardo Jr.’s colours are gorgeous as always. Both artists feel like they are actually trying to make an enjoyable comic book, and I certainly appreciate that since I’m not sensing an ounce of effort or care from the writer or the editorial staff. Ugh. I still can’t believe we have months of this left. MONTHS, gang. Or, if I’m right about being in Tartarus, all of eternity. 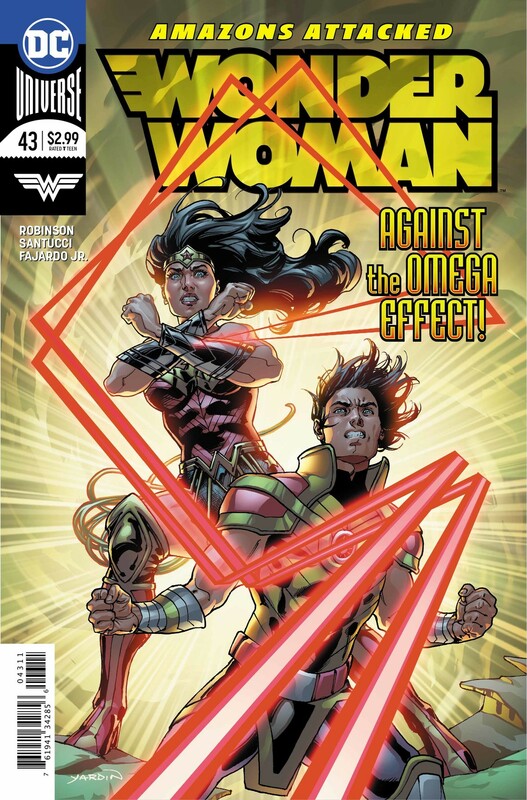 Wonder Woman #40 Review: Still With This Foolishness? Do not read this review unless you want to know all of the big reveals from this issue! I mean, most of these reveals are very dumb! Reviewing this series lately just feels like making a list of complaints, which is something I do not care for. And yet, here we are again. I’d much rather be celebrating a fine comic book than criticizing a bad one, but this book just keeps finding new ways to be unpleasant every other week. It’s like compounded interest, except with terribleness instead of money. And I’m not at all shocked to see a new array of dumb decisions in this issue, on top of the already asinine storyline. Let’s start with the art. It was fairly solid, as always. Emanuela Lupacchino and Carmen Carnero are quite good at their craft, and there was a lot of nice work in this outing. Throughout this run, the art has been the one decent thing we can count on, even when these fine artists are drawing the dumbest of stories. However, there was an odd choice that I didn’t much like. Lupacchino drew Jason towering over Diana, making him a full head taller than her in several panels. She often looked like a little pixie when next to his imposing frame. First, this is new. Jason was drawn only slightly taller than Diana initially. And second, Wonder Woman is tall. She is an imposing figure herself. To make her look small, you have to be a dang giant, or at the very least some sort of basketball star. Moreover, the juxtaposition made her look not weak, but lesser, to a degree. There’s nothing at all wrong with being shorter, of course. Strength is not relative to size. But Diana and Jason are twins, and I think it’s a poor choice to make the male twin so much bigger. Especially in a genre where the men are typically behemoths and the women are tiny. They should be equals, and they’ve not been drawn as such here. We’ve also got a condescending Steve Trevor moment in this issue that felt very out of character. If you’re not writing Steve Trevor as a good dude, you’re not writing him well. He is a fundamentally decent, respectful person, especially when it comes to women. So I found it a bit during when, during his battle with the Furies, he patronizingly called Lashina “sweetheart.” It’s a small thing, to be sure. But it’s a small thing that’s indicative of a writer who’s just doesn’t seem that interested in getting the characters right. That’s not something Steve would say. And since he’s only in two pages this issue, and has been an afterthought for a lot of this run, such a glaring error stands out especially sharply. This outing also sees the introduction of another villain, and I’m not excited about it. Why would DC give Robinson the chance to screw up another classic Wonder Woman villain? It’s mind boggling. The revelation comes near the end of the issue, when a reflection reveals that the kindly Dr. Edward Carne looks to in fact be Dr. Psycho. Now, I’m not great at predicting plots and twists, in part because I don’t like to. I’d rather just follow along with where the story’s going. But the second the book introduced a short, friendly doctor talking about “the power of the mind,” my immediate thought was “well, that’s probably Dr. Pyscho then.” I was very amused when the next page revealed just that. It’s a weak twist, and I really don’t want Robinson to screw up this character too. Haven’t we been subjected to enough already? I have zero faith that he’ll do something interesting with him. Elsewhere, the arc continued in its usual underwhelming way. Diana and Jason argued about proper heroing. There was another fight with the Silver Swan, and ultimately Wonder Woman captured here. Then Jason decided to run away because he’s so bad at being a superhero. Except that when he went to leave, he was swept up in some type of malevolent purple force. My fingers are crossed that he’d dead and gone, but that seems unlikely. Chances are, Grail and Darkseid have him now and we’ll see him again sooner than later. So the overarching story is still plodding along. The Silver Swan tale is done for now, and it sounds like we’ve got Darkseid vs. the Amazons coming up next. And then, hopefully, a new creative team that knows what they’re doing. But after all of this complaining, let’s take a moment to recognize something amazing about this series. Jenny Frison has been doing variant covers for Wonder Woman for well over a year now, and they are consistently fantastic. I usually put up the main cover at the start of my review, but DANG did Frison outdo herself this week and I had to post that instead. That cover is stunning, and one of her best yet. I don’t know why DC isn’t making her covers the main ones, because they are gorgeous. Though really, I don’t know why DC isn’t doing a lot of things differently with Wonder Woman these days. Nonetheless, what a stellar piece of art. She’s been doing phenomenal work.